My poor goal list didn't get much finished this week. 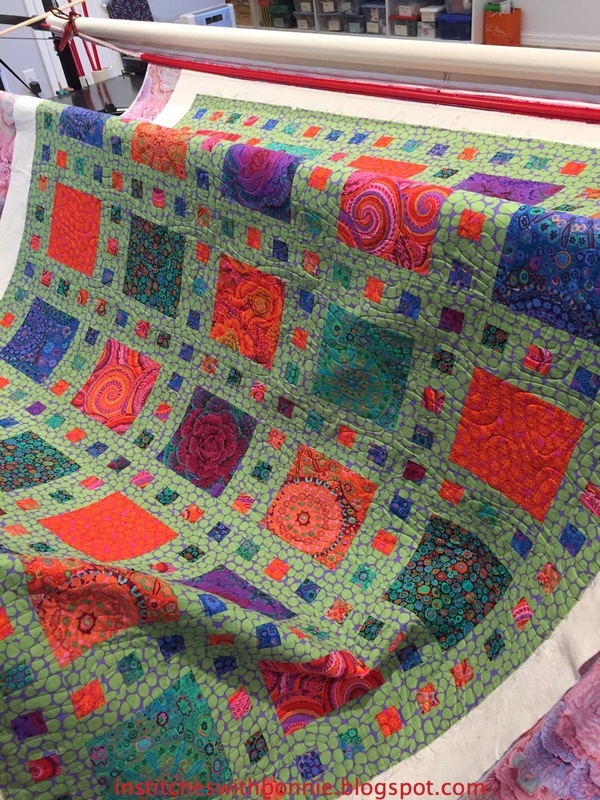 I did quilt another Slide Show quilt made by Dorothy. 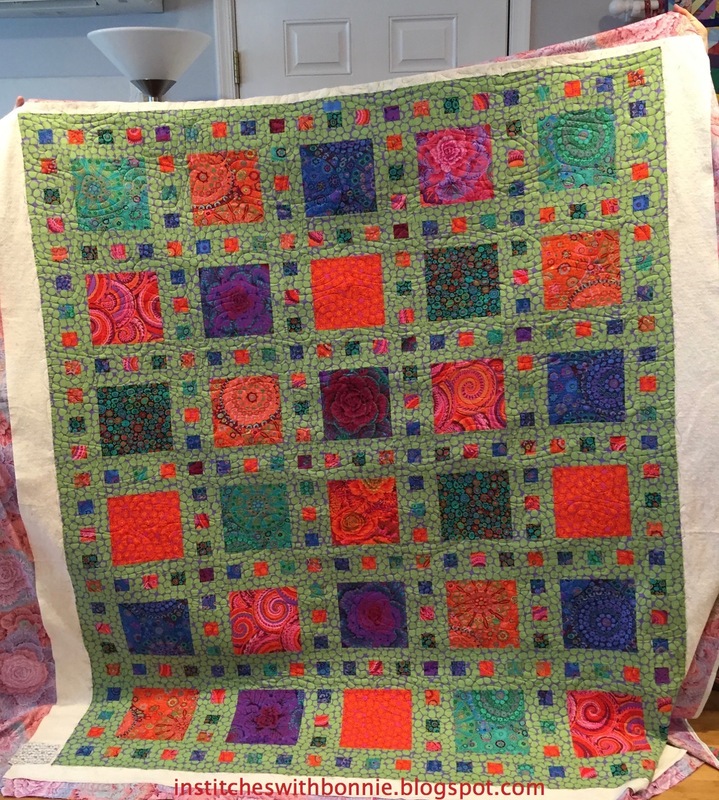 She used Kaffe Fassett fabrics that really makes a different looking quilt than the one I made for the Mid-Atlantic English Springer Spaniel Rescue. Here it is just before taking it off Ruthie, the long arm. And wow! Don't you love this wild backing? It was a pleasure tequila to quilt. (Don't you just love auto correct!?) You can't see the quilting design all that well but it was African Samba by Apricot Moon; Omni thread; and Warm and Natural batting. Dorothy was very pleased with the end result. And, she plans to keep this one. I will admit the other side is completely cleared off so I could do some cutting if I needed to. Pick a quilt in the waiting pile to quilt! Load & quilt. Yikes, not very good at all. Although I somehow got several books finished... And, here's what's on tap for this week. 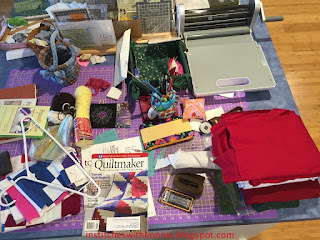 Spend some time sewing something! That's it for me today. I've got a lot on my plate and won't be getting all that much sewing done. 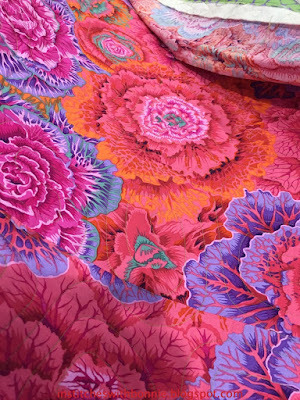 On the other hand, I won't be buying new fabric either! I'm linking up with Main Crush Monday. I recommend you take some time to see what others have been working on in the last week. I'm looking forward to poking around the internet when I have down time! I do take down time cause my feet start to hurt! Ambitious goals -- when you accomplish them you can treat yourself to a day in your sewing studio! I nodded my head in agreement when I read that your children have no interest in the things you've saved and collected. I fear that will happen with the family antiques that I inherited. My nieces and nephews seem to have no interest in that bit of family history, and it makes me sad. Slide Show turned out beautifully! I can see why she's keeping it. Thankfully my brother has pretty much said he'll keep anything my sister and I don't want of Mom's. Good luck with all the sorting and organizing. My mother-in-law is moving in with her youngest son and is doing the same cleaning up as you. We are inheriting several pieces of furniture. I don't know where I'll fit them in, but I love the history behind them and am happy to have them. Hopefully my boys will be interested in them when that time comes. Good luck this week!